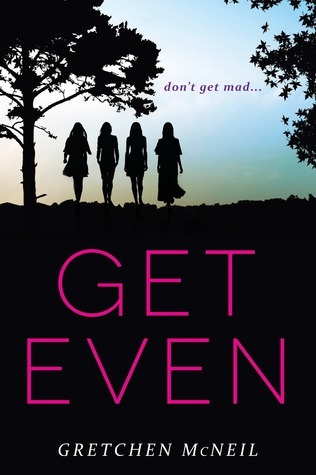 Get Even is a fun, suspenseful, girl mystery novel with a strong Pretty Little Liars feel. There is a wide variation of main characters in this story which I thought was great because it gives something to every type of reader. The four main girls all have different personalities, interests, and social groups. You get Olivia the popular girl in love with acting, Margot the quiet and smart girl with inner turmoil, Kitty the athlete and part of student government, and Bree the rebellious one. You also get to see the story from all of their point of views. This way you got a wide range of angles of the story and you were able to find a character that you best fit with. Their target ends up dead near the beginning of the book which allowed you to jump right into the mystery and suspense. There are many different parts to the mystery to keep you busy. The murder investigation is action-packed in itself but you also get other mysteries when somebody, possibly the murderer, starts sending them manila envelopes which uncover secrets buried in their own group. McNeil did a good job balancing everyday high school situations with the murder investigation. I liked this because you still got to learn more about the girls lives and their backstories instead of just everything focused on finding the killer. Speaking of the killer, I have no idea who they are. I have had multiple guesses throughout this book but I have a feeling they are way off. I want the second book so I can get to the bottom of this, also that ending needs to be resolved. I have to know the outcome of what she did and if certain people survive! The only thing I wish there had been more of in this book was the actual acts of their group DGM. You get to see them pull one small prank right at the beginning of the book but the moment the murder happens their group starts to fall apart. I had thought the concept of DGM was intriguing and added something more to it making it more then a basic teen murder mystery. I just wish I had got to see the group in action. Overall Get Even is a great teen murder mystery which girls and especially Pretty Little Liars fans will love. I enjoyed Pretty Little Liars up until the 8th book or so then it just became too much so if this gives me the same feel but doesn't go on forever. I will probably really enjoy it too. The same thing happened to me. I really enjoyed the first couple PLL books and then they just dragged them on for so long they lost their original flair and I gave up. I would definitely give this a shot though. It will remind you of why you liked books like Pretty Little Liars in the first place.